East Hill, or East Hill-Meridian, has a population of about 30,000 and belongs mostly to the city of Kent. 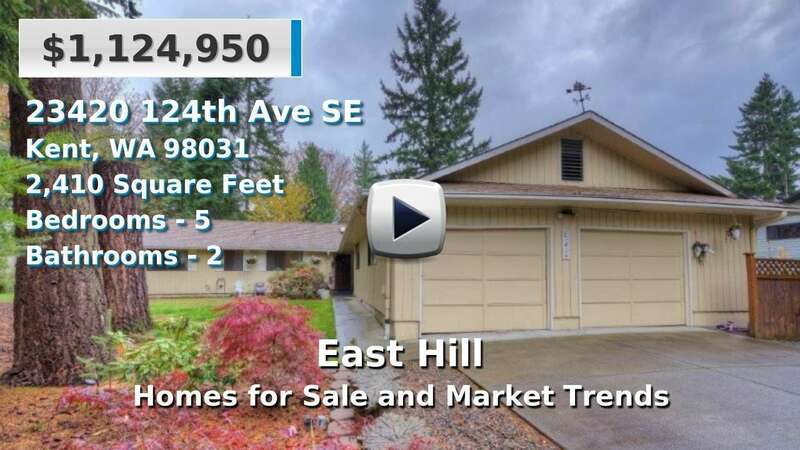 East Hill features a mix of new and 1970's era single family homes and condos for sale. This area, east of Kent, naturally, is convenient to the SeaTac Airport and the Renton-Tukwila area. Nearby Soos Creek Park, Clark Lake Park, Lakes Youngs and Meridian, and the Puget Sound offer all kinds of recreation and entertainment opportunities. 4 Beds | 2.75 Baths | 2390 sq. Ft.
4 Beds | 2.25 Baths | 2110 sq. Ft.
3 Beds | 2.25 Baths | 3220 sq. Ft.
5 Beds | 2.75 Baths | 3421 sq. Ft.
4 Beds | 2.5 Baths | 3310 sq. Ft.
5 Beds | 2.5 Baths | 2650 sq. Ft.
3 Beds | 3.25 Baths | 2940 sq. Ft.
3 Beds | 2.5 Baths | 1229 sq. Ft.
3 Beds | 2.5 Baths | 2953 sq. Ft.
5 Beds | 3.75 Baths | 3000 sq. Ft.
3 Beds | 2 Baths | 1003 sq. Ft.
4 Beds | 2.5 Baths | 2101 sq. Ft.
4 Beds | 2.25 Baths | 3040 sq. Ft.
5 Beds | 1.5 Baths | 1890 sq. Ft.
3 Beds | 1.75 Baths | 1367 sq. Ft.
3 Beds | 3.25 Baths | 1610 sq. Ft.
5 Beds | 4 Baths | 3590 sq. Ft.
Blue Summit Realty has the most accurate and up to date East Hill real estate listings on the web. Currently there are 38 homes for sale, 7 condos for sale, and 9 vacant land properties in East Hill. Of the 55 total East Hill residential listings for sale 0 are bank owned, 0 are short sales, 0 are new construction, and 0 are townhomes. The price ranges from $230,000 to $0 with a median list price of $520,973 and median sold price of $428,428. Make sure to refine your East Hill real estate search by property type, price, square footage, bedrooms, bathrooms and more with the search tool above or view the East Hill listings on our interactive map. Our East Hill real estate listings were updated 22 minutes ago.